Cornet Gareth Renwick and his right and left-hand men Ali George and Euan Reilly leave for Mosspaul. Hawick Cornet Gareth Renwick led 120 followers along the 24-mile route to Mosspaul on Saturday before repeating that feat just three days later with another 60-odd. The 22-year-old mill mechanic was once again blessed with fine weather on Saturday as he welcomed visiting principals from around the Borders into the cavalcade for what was, for most, their debut rideout. He added: “The actual Mosstroopers committee look after you brilliantly, starting with the dinner on Friday. “We had a great sing-song on both Saturday and Tuesday, and they’re a really hard-working committee of men. There were, however, a few falls on Saturday, with one Hawick rider suffering a fractured back, 2015 Langholm cornet Jamie Fletcher suffering a broken leg and Selkirk attendant Craig Monks injuring his hand. The cavalcade was met at Mosspaul by Hawick Scout Pipe Band and accompanied back into town that evening by the Hawick Saxhorn Band. “Coming back to the town behind the band for the first time was unbelievable,” Gareth added. He now has just one rideout left to lead before the start of the main common riding events next week. He said: “Denholm is the last rideout before the big week starts. It’s quite a difficult ride too, taking over three hours to get there via Bonchester, but it’s really good on the way there and it’s always heaving on the green, especially if it’s a decent day. “It’s always a great atmosphere there, and we’re meant to be in for another good day on Saturday. Tonight will see Gareth and acting father John Lyle lead the first chase to St Leonard’s, where John will receive his badge of office. Gareth said: “That’s John’s big night. It’s when he officially becomes acting father. “It’ll be my first time going into the hut as cornet too, which is a bit daunting. “I’m used to being there and just clapping along with everyone, but this time everyone will be cheering for me, and I’ll make my first speech there too. 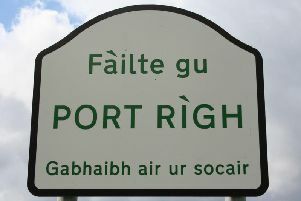 Saturday’s rideout to Denholm leaves Backdamgate at 12.30pm and arrives at the green at 3.45pm. The cavalcade leaves again at 6pm, with the cornet and his henchmen making an added visit to Hornshole. The horses arrive back at Towerknowe at 8pm. 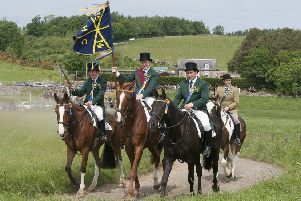 Next week sees the run-up to the main Hawick Common Riding events. On Sunday, the kirking takes place at 11am in Hawick Trinity Church and is followed by a wreath-laying ceremony at the Hornshole memorial at 3pm. The early-morning chases on Monday and Wednesday both leave Backdamgate at 6.30am to head to St Leonard’s, where they remount at 7.30am. Common riding Thursday kicks off at 6am from Backdamgate with a ride to St Leonard’s, the racecourse, Crumhaughhill and back to the town hall. That is followed by the cornet’s school visits, and the evening ceremonies including the colour-bussing, proclamation from the burgh cross and the cornet’s walk. Friday’s events again begin at 6am at Kirk Wynd and conclude with the common riding dinner and the ball that evening. A week on Saturday, the principals visit the mote at sunrise before leaving Backdamgate at 9.30am. The day ends with the returning of the flag at the town hall at 3.50pm. Full details are available in the Hawick Common Riding timetable.